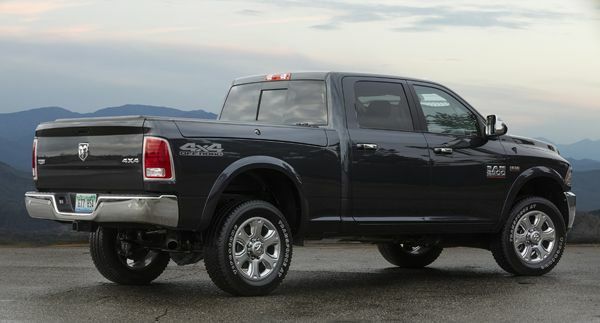 Dodge spun off the Ram truck line into its own nameplate in 2009. Since, the light duty pickup with a bold and beefy face has been gaining in popularity with U.S. buyers, breaking into the top ten of America’s best-selling vehicles in 2013, and sitting in third place since 2014. Ram trucks have received Motor Trend magazine’s Truck of the Year award five times; the fourth-generation Ram Heavy Duty won in 2010 and the current Ram 1500 won in 2013 and 2014. As the Ram 1500 model reaches the end of its fourth generation, Ram has created a new high-end 2016 Laramie Limited model. It wears a new front grille design with prominent badging, as well as authentic wood and premium leather materials tailoring the interior; it’s intended to please uplevel pickup buyers. Ram marketers call the Limited a “black-tie” luxury alternative to the popular southwestern-themed Laramie Longhorn edition. The 2016 Ram 1500 also features new frame and body modifications to improve its Insurance Institute for Highway Safety (IIHS) small front overlap test scores. The 2016 Ram 1500 Laramie Limited’s all-new grille is the most obvious change to the exterior. Its novel billet port grille breaks from the long tradition of crosshair styling with bold “RAM” lettering. Illumination comes from premium bi-function automatic halogen projector SmartBeam headlamps with chrome surround up front, and chromed taillamps with LED turn/stop/running lights out back. Limited rides on standard 20-inch aluminum, satin carbon premium painted face, multi-insert wheels with chrome accents wrapped by P275/60R20 BSW all-season tires, or unique 20-inch forged multi-surface aluminum wheels wrapped in P275/60R20 OWL all-season tires. The 2016 Ram 1500 Laramie Limited features a cabin that is the apex of modern luxury created for the customer who appreciates plush details like subtle stitching accents, elegant pin-striping, and modern and distinct patterns. A new console bin houses a cellular phone and tablet holder, which can be concealed with an innovative tambour wood sliding door made from Black Argento wood, the timber selected for the upscale interior. The silver pin-stripe theme runs through the wood and a satin chrome handle rolls the door open with ease. Riders will also enjoy solid black premium Berber carpet inserts, which can easily be removed from the floor mats to reveal practical double-duty slush mats, as well as the attractive all-black headliner and pillar-trim. The cockpit is wired with a cache of communication and technology features, including an 8.4-inch Uconnect system with 3D navigation, a standard rearview camera system with dynamic gridlines, and ParkSense front and rear park assist system, as well as steering-wheel mounted audio controls and Bluetooth connectivity for hands-free phone, streaming audio, voice command, and text message reader. Remote keyless entry provides access to doors, tailgate, and RamBox (when equipped), plus remote start, illuminated entry system, and engine immobilizer security system with panic alarm. The 2016 Ram 1500 Laramie Limited is available in six-passenger Crew Cab body style (five passengers with the available bucket seats), with a choice of a 4×2 or 4×4 powertrain, as well as 5-foot, 7-inch bed set on a 140.5-inch wheelbase or a 6-foot, 4-inch bed on a 149.4-inch wheelbase. Crew Cab models sport a power-sliding rear window with a backlight, and a standard locking, removable tailgate with lift assist. Hard-core users with the need to carry goods and gear in the bed will appreciate the optional RamBox cargo management system, which includes lockable and drainable weatherproof integrated storage bins and rails with four adjustable cleats and a dual-purpose bed divider/extender. Standard is a 5.7-liter HEMI V-8 with variable-valve timing that produces 395 horsepower and 410 lb.-ft. of torque; mated to an eight-speed TorqueFlite transmission with a center stack rotary shifter; this combination delivers 15 city/22 highway mpg fuel economy. Optional is a 3.0-liter turbocharged EcoDiesel V-6 engine paired with an eight-speed automatic transmission with center stack rotary shifter, which creates 240 hp. and 420 lb.-ft. of torque and brings 21/29 mpg. When properly equipped, maximum trailer weights range from 6,760 lbs. up to 10,090 lbs., depending on powertrain and box size. Manufacturer’s suggested retail pricing for the 2016 Ram Laramie Limited starts at $51,295 (plus $1,195 destination). Horsepower and torque: 3.0-liter turbocharged EcoDiesel V-6 makes 240 hp and 420 lb.-ft. of torque.